Explanation: Six worlds orbit Kepler-11, a sunlike star 2,000 light-years distant in the constellation Cygnus. The new discovery, based on data from NASA's planet hunting Kepler spacecraft, makes the Kepler-11 system the fullest exoplanetary system known. 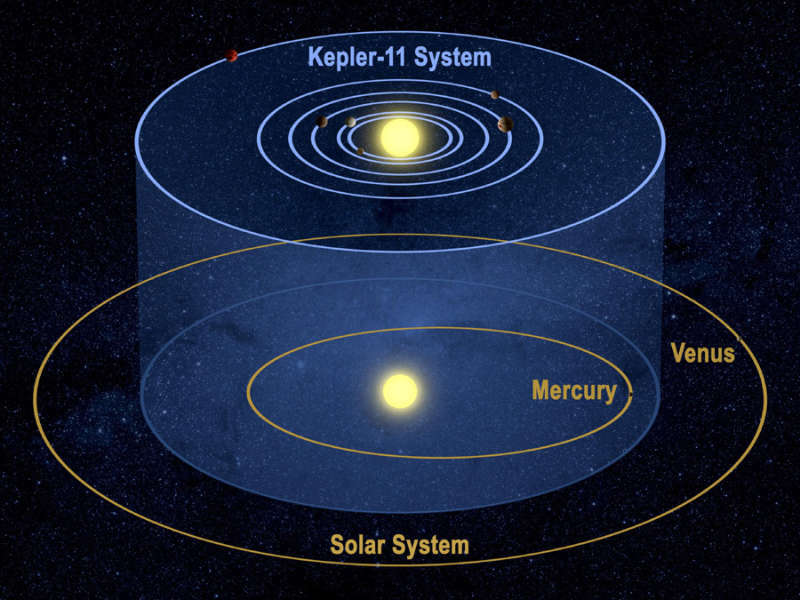 Compared to our Solar System in this illustration, five of Kepler-11's planets orbit closer to their parent star than the Mercury-Sun distance, with orbital periods ranging from 10 to 47 days. All six are larger than Earth and are likely composed of mixtures of rocky material and gas. Their presence, sizes, and masses have been determined by carefully watching the planets dim the light of Kepler-11 while transiting or crossing in front of the star itself. In fact, in August 2010, Kepler's telescope and camera recorded a simultaneous transit of three of the planets in the system. As announced yesterday, using the transit technique the Kepler mission has now identified over 1200 exoplanet candidates in a field of view that covers only about 1/400th of the sky. The tantalizing result suggests there are many undiscovered planets orbiting the stars in our galaxy.